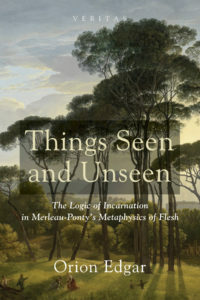 Available in the Veritas series: Things Seen and Unseen: The Logic of Incarnation in Merleau-Ponty’s Metaphysics of Flesh, by Orion Edgar. The philosophy of Maurice Merleau-Ponty was developing into a radical ontology when he died prematurely in 1961. Merleau-Ponty identified this nascent ontology as a philosophy of incarnation that carries us beyond entrenched dualisms in philosophical thinking about perception, the body, animality, nature, and God. What does this ontology have to do with the Catholic language of incarnation, sacrament, and logos on which it draws? In this book, Orion Edgar argues that Merleau-Ponty’s philosophy is dependent upon a logic of incarnation that finds its roots and fulfillment in theology, and that Merleau-Ponty drew from the Catholic faith of his youth. Merleau-Ponty’s final abandonment of Christianity was based on an understanding of God that was ultimately Kantian rather than orthodox, and this misunderstanding is shared by many thinkers, both Christian and not. As such, Merleau-Ponty’s philosophy suggests a new kind of natural theology, one that grounds an account of God as ipsum esse subsistens in the questions produced by a phenomenological account of the world. This philosophical ontology also offers to Christian theology a route away from dualistic compromises and back to its own deepest insight.